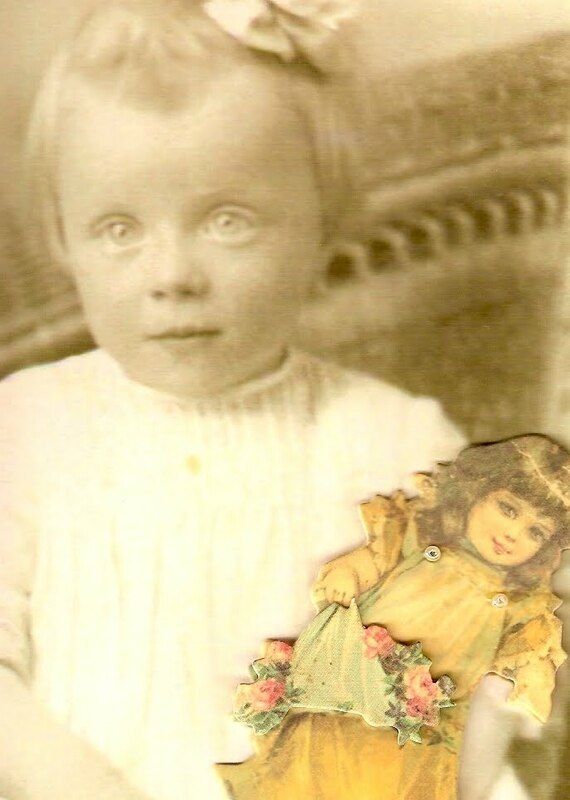 Gladys Louise Gates Meining Gentry was born October 15, 1908 in LaHarpe, Allen County, Kansas, second child to Edward Earl and Sarah Elizabeth Sigler Gates, with a twin brother, Glen soon competing. In Gladys’ own words: When I was two, we moved to Center, Colorado, soon moving into the high timberland beyond Center. Our family increased by three more brothers, Wayne Kenneth, Dale, and William Donald (Billy). So I am the only girl amongst five roughneck brothers. We lost Dale during a flu epidemic in 1921. I believe my earliest recollection is of a Christmas when I might have been four. My folks had put a dolly on the community Christmas tree unknown to me. I remember sitting in the crowd and desiring only that doll. Everyone’s name had been called and all the children had their gifts but me, and then lo and behold, that doll had my name on it. A child could not have been more enraptured than I was. My twin brother and I were dressed alike in red coats. When Santa entered we were terrified and flew over the pew to our mother. What a funny little pair we must have been. When I was seven, and we were living in the mountains, I had a chronic appendix attack. My dad had to take me on horseback about ten miles, cradled in his arms, to the nearest neighbor who could get a hold of a doctor. I remember vividly the doctor coming to the neighbor’s house for me in his car. They took me to the hospital in Alamosa, Colorado for an emergency operation. I said some things backwards about then, and so I called the hospital "pital house" and my suitcase was a "case suit." I have such fond memories of the snow country, of being bundled up cozy, going off for sleigh rides. A couple of winters, we children had to ride seven miles to school on horseback. At one time, Dad bought us a buggy, but we wrecked that racing the neighbor kids. Dad used to take me on a nice camping trip up in the high mountains each autumn before school started. The outdoors and horses have always been my big love in life, a life that I still desire at fifty-two years of age. During my high school years, we lived on a cattle and hay ranch in Saguache, Colorado. We had been here a couple of years when Dad moved on to Gunnison and the folks separated. I wanted to be a nurse and would have gone to college if they had not divorced. I met Otto Albert Meining, who was a neighbor, and we went together off and on a couple of years, as mother didn’t care for steady dating. Then on September 4, 1926, Otto and I were married. We were soon joined by our darling daughter, Betty Louise. She was born around midnight of May 29, 1927. She was born at the home of Dr. Pugh. She weighed less than four pounds and her head would fit in a teacup. Death called Otto away October 22, 1931 of double pneumonia. The doctors couldn’t save him. Betty and I moved to Salida to my mother where I worked that winter to pay off our bills. 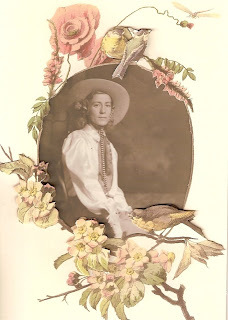 The spring of 1931, Betty and I moved down to St. Thomas, Nevada, to join dad on his cattle ranch on the Arizona strip. We arrived in St. Thomas by train in the evening, but had to wait all day in Moapa for the local train. Dad met us at the tiny station in St. Thomas, and we walked through the sand down to the Gentry Hotel. The hotel was deserted because the government had bought out St. Thomas to build Lake Mead by then. The morning after our arrival, Dad gave me a lovely palomino mare named Polly. How delighted I was. She was such a joy. Here I met Osborne Leland Gentry. He helped move us out to Dad’s place at Seven Springs on Grand Wash. There he came courting me in his little rumble seat Plymouth for about a year and a half. On March 26, 1933, Osborne and I were married by Robert Gibson in Las Vegas, and honeymooned on lovely Catalina Island on the coast of California. We took the glass-bottom boat tour and watched the divers harvesting abalone shells. We had left a very unhappy Betty in St. Thomas with Osborne’s sister, Della. We spent three years near Overton where Os hauled red sand. Then we moved to El Dorado Canyon for one of Betty's school years, then onto Goodsprings for two more years where Os worked in the mines. In 1940, Gladys Gentry was voted Queen of the Rodeo - a big thrill for her. She says, "Os sent me flowers. The envelope read: "For my sweetheart." Inside the card read: "With love, I know you are going fit as a fiddle. Your hubby, Love, Your old man." Grams and Papa moved to Tassi to help Grandad, (Ed Yates) while her brother Wayne was in the Air Force in the South Pacific during World War II. Wayne was attached to the plane, "Pistol Packin' Mama" and they got word the plane went down. They didn’t know for awhile whether Wayne survived. Then they received a letter from him. Gladys goes on to tell of later years. Betty married Sonny Lewis in June of 1946. We welcomed our first grandchild, Naomi, May 12, 1948. In 1950, we partnered with Osborne’s brother Sam on a herd of sheep in Imperial Valley (Brawley), California and lived in a small silver trailer with a green stripe around it. We did fair, but then Sam died suddenly of a heart attack and we were soon out of the sheep business. In 1950, we saw the birth of our second Grandchild, Malcolm Lee Lewis, and in 1953, Cornel Arthur Lewis was born to our daughter, Betty and Sonny. In 1954 we moved back to Overton and the sand mine and lived in a train car, then owned by Simplot. We stayed in Overton until July 1959, when we moved back to the Arizona strip and went into partnership with my dad raising Hereford cattle. Dad was getting up in years by then and we moved back to Tassi to be with him. How we loved to bring Betty and the children out to the ranch for holidays and a couple weeks in summer while they were out of school. Summers were a time of canning fruit and vegetables and we had a pantry at the back of the house where I enjoyed lining up the work of my hands. I loved to work with my hands. We also made beef jerky and I dried figs on screens on the roof of the house. Sugared and bottled, they were a wonderful treat for everyone all year. I always planted a garden. I was in heaven when I was outdoors in my garden. It was a source of pleasure, and we ate from the goodness of the land. We stayed at Tassi several years, then Dad, Os, and I moved to Mesa, Colorado at the foot of Grand Mesa for several years and raised calves. Betty and the children came to spend summers with us there. How grand it was to eat from my garden. The children loved the fresh strawberries, and the cream came from our own cows. I made our own butter fresh several times a week. Everybody's favorite breakfast dish was my peppered hash browns with whatever else, it didn't matter, as long as we had hash browns. Mesa was beautiful every Autumn, and I loved to watch the colors change and move from the top of the mountain down to us at the base of the mountain. Grand Mesa has over 100 lakes on top. 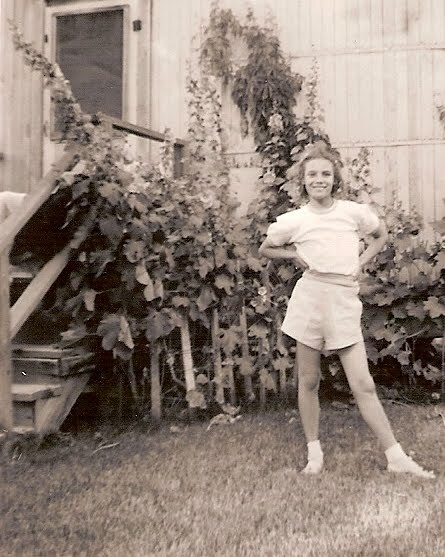 We pumped water in the kitchen from a hand pump connected to a cistern under the house and we didn’t have indoor plumbing, but I had a yard full of irises of all colors and a huge lilac bush that was so fragrant, and huge trees for shade. We had a fruit orchard beside the house and canned our fruit and vegetables for winter—applesauce and apple butter, apricots, peaches. Dad and I dug a cellar and covered it with earth, where we stored our beautiful bottles of canned fruit, vegetables, and pickles. It was a large cattle ranch with a stream running through it and a big barn for the hay and the milk cow. Our neighbors grew cucumbers, whole fields of them, and they made wonderful pickles and relish. Everyone gave of what they had and shared with their neighbors. We were all happy in Mesa, but were too far from home and family, so moved back to Mesquite, Nevada and here we all retired. We bought a little house with a wonderful basement. It was so cool in the summer and a nice refuge, and also a good place to store my canning. Dad (Ed Yates) died, May 11, 1980, in Mesquite, Clark County, Nevada. My health was also failing. November 4, 1980, we bought a double-wide mobile home. Betty worked so hard to set everything up for us and we moved it to about the spot where Os and I started our married life near his sister Della’s home below Overton. Gladys died May 26, 1981 and was buried in St. Thomas cemetery, a hill with a beautiful view of the red mesas of Overton and the blue Bunkerville Mountain in the distance, where she spent so many memorable times. Osborne followed May 24, 1982. The following is an account of my memories of canning with Grams, Mom and Great Aunt Laura. The windows fogged with steam. From the living room, I could hear the rhythmic rattle of jars bumping together on the stove in an open pan of boiling water. This is how we sterilized the bottles for canning. Lids and rings were laid out on clean white cloth towels. Summer was here. I entered the kitchen to a sauna of sugar and water. Grams stirred the sweetness with a long-handled wooden spoon. The candied mosaics of molten sugar changed continually in the pan with endless stirring. Bushels of peaches and apricots filled the dining room, bringing the orchard inside. Summer meant canning and Grams was a master canner. Three generations of women: Grams, Papa's sister, Aunt Laura, the first woman to ever study geology at Columbia University, my mother, and my barely teenage self, worked side by side with flickering knives. First we pitted and peeled each piece of fruit. We pulled the peelings off in big layers with the sharp edge of the knife so we didn't damage the look of the peach or apricot or plum or pear. Juice and pulp coated my hands and dripped down my arms to roll off the crook of my bent elbows as hours passed away from my beloved swimming pool and the high-dive board. "You'll be glad this winter," Grams said, at my complaint. And I was glad. After the fruit was cut in half, they were slid into the sterile bottles with the curve of the fruit to the outside. When the sugar water was ready was clear as amber, it was poured over the fruit until the bottle was full. A lid was plopped onto the rim of the bottle to be naturally vacuumed down as the mixture cooled. This process continued for days until all the fruit was preserved and ended up like harvest moons in sterile bottles of sweet water. After the fruit was stored away, pickles were cut into thin spears, to make me pucker on a winter's day. I remember trying not to let the itchy stems touch my skin as I cut cucumbers from the vines. They were married in the bottle with dill that looked like specimens of extra-terrestrial wild flowers. All the garden vegetables took their turn—green beans, peas, beets, sweet corn, yellow as sunflowers, ended up in Mason jars. Tomatoes, plump, almost transparent, scarlet jelly fish, floated whole in their own juice and some secret ingredients only Grams knew. The red pulp and seeds were ground for tomato sauce and special pickle, tasty as the day is long, on Sunday's roast beef and baked potatoes. And when it was time for dessert, it was strawberries picked with Grams' gentle fingers at daybreak. Summer ended with picking, peeling, and cutting into wedges, the tempting fruit from Grams apple trees. Then came the grinding, and finally boiling with spices and sugar, smoothing out the tartness, that turned Eve's temptation into apple butter fine enough to win the Mesa County fair, if Grams had wanted to enter it. When the bottles were cool, one was popped open for tasting all around, and nods of approval. "Another good year," Mother said. "As good as last, do you think?" Grams asked. Everyone always agreed. Every year was better than the last. Even cold months later, the spices still showed as small flecks in the smooth, brown pulp packed in jars. I was always mesmerized as I stood before the shelves, floor to ceiling, in Grams' pantry, full of luminous colors, and diverse textures and flavors. The treasures disappeared bottle by bottle to this friend, or that person in need, or the dinner table, always a summer day, hot in the making, to warm a long cold winter evening with remembering. I didn't mean to wax eloquent about canning. We don't know in advance the things that will bring us to tears after years of forgetting. I can still smell bacon and fried potatoes. Oh, my heart, Grams peppered-fried potatoes were the best ever--always made in the cast iron skillet waiting for Sleeping Beauty to rise late on a summer morning. Then we would drive a full half-hour from Mesa to church in Colburn, or to the library. Reading was a luxurious way to spend a summer day, with the clatter of the house going on around me. I couldn't do it often, but Grams made sure I received a reward for my hard work.